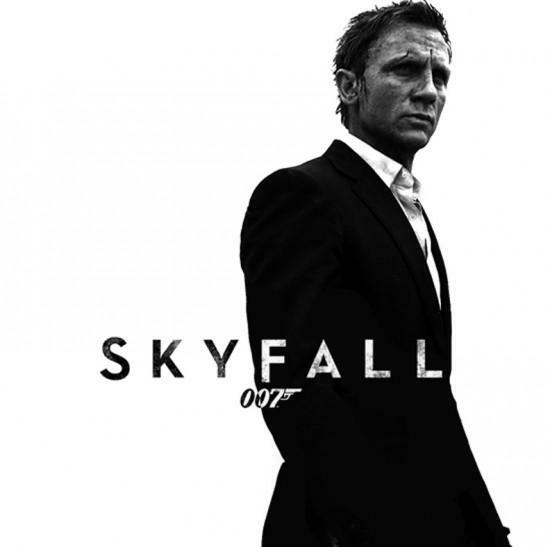 Like a dutiful American, this Thanksgiving holiday I gave thanks by trundling down to the local theater (in Pittsfield, Massachusetts, where I grew up), and plunked down my hard-earned dough to see the latest James Bonds flick, "Skyfall." It was good. I really like the direction the franchise took starting with "Casino Royale" and its Daniel Craig Bond. In fact -- and this may be blasphemous to the memory of the Sean Connery Bond -- I think the past three have been...gulp...the best so far. And Adele's "Skyfall" the best Bond theme music, too. It's perfect, Adele a nod to the jazziest earliest origins of Bond themes, the music sparer than those early themes, but still with the brassy Bond hook. Great stuff. But then -- probably to the horror of my more musically sophisticated Reader comrades -- I like Adele. Whatever. I made a Spotify playlist of all the available Bond themes for your listening pleasure -- sadly, though, "Skyfall" ain't up yet. 2. "Goldfinger," Shirley Bassey. The classic. The masterpiece. Bassey sets the standard for all subsequent themes with her barely restrained half-sensual, half-angry croon with the extravagent background of a big-band jazz sound. 3. "Die Another Day," Madonna. Okay...maybe a stretch. But it kicks *ss, breaks all the rules. Plus you can dance to it. I'll regret this pick in the morning, I'm sure. 4. "Live and Let Die," Paul McCartney. Rolling Stone really likes this one, rating it the best of the Bond theme songs. I can't help be slightly annoyed by it as a fine example of McCartney's tendency towards the treacly, over-produced pap he'd wallow in during the 80s. Still, one of the best Bond themes. Mixes tempo, theme, has a strong melody. 6. "A View to a Kill," Duran Duran. Wicked opening. One of the better Duran Duran songs, too. Still...Duran Duran. 7. "Another Way to Die," Jack White and Alicia Keys. Love the hard guitar riffs of Jack White. Fits Daniel Craig's Bond perfectly. 8. "Moonraker," Shirley Bassey. An absolutely ridiculous movie -- but awesome! Jaws...the battle in space...the premise...and Bassey's second-best effort. 9. "Thunderball," Tom Jones. Not a great song -- the Bond themes get a little weak towards the bottom of this list -- but Jones really belts this thing out, turns it into a kind of gonzo jazz performance. 10. "Goldeneye," Tina Turner. Again, not the greatest song, but like Bassey and Adele, Turner's got the pipes for the job. Often overlooked in the pantheon of Bond themes. Composed by Bono and the Edge! 1. Rita Coolidge's "All Time High," a worn-out, overproduced disco tune already five years out of date when it was released. 2. Lulu's "The Man with the Golden Gun." A sad attempt to return to the jazzy style of the 60s Bond tunes. 3. Sheryl Crow's "Tomorrow Never Dies." Crow is the absolute wrong singer to try to croon out a traditional Bond theme, as evidence by this sad piece. Maybe appropriate to the Pierce Brosnan chapter of the Bond franchise, however.